Find out all about the Brutes in Bungie's 7-minute preview video up now on the Marketplace. 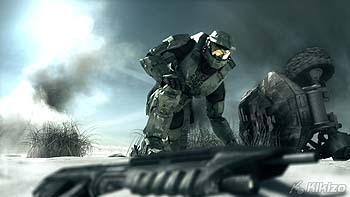 For a game that many people assume is coming out only towards the end of 2007, there's a fair amount of Halo 3 info trickling out of Bungie. The latest snippet is a 7-minute documentary on one of for Master Chief's enemy main opponents. Cleverly titled Et Tu, Brute?, the new feature goes into the theory and the design of the redesigned Brute race in the series' Xbox 360 debut. These gorilla-like creatures have been transformed from their shallow ways in Halo 2 into a hierarchical race bent on mass destruction. In the short the developers take you through the concept stages, when the Brutes were reimagined, all the way through to their animation and group AI programming. Don't go looking for visuals of the kind we'll see in the final game as all in-game footage is from pre-alpha development versions. The character switching twist in Halo 2 has left many to ask whether we'll be playing as the Brutes in Halo 3. We won't, at least not according to Bungie's Frank O'Connor, who also warns: "There are no finished graphics in the documentary, and everything you see is a work in progress." Microsoft is turning up the volume on Halo 3 ahead of the public beta testing of the game's multiplayer, due to start this spring.